Hunting for opportunities in the midst of the Brexit crisis? These undervalued stocks may be just what you're looking for. Global stock markets are going through considerable volatility due to Brexit. It's hard to tell how the situation may evolve over the coming weeks, but the good news is that you don't really need a market-forecasting crystal ball in order to make solid investment decisions over the long term. Far from that, short-term uncertainty can usually be a source of opportunity for investors who are smart enough to buy top-quality businesses, at conveniently low prices, with a long-term horizon. Companies such as eBay (NASDAQ:EBAY), Apple (NASDAQ:AAPL), and Priceline (NASDAQ:BKNG) look attractively cheap at current prices, and they are interesting candidates for investors looking to transform short-term volatility into long-term opportunity. E-commerce is an attractive growth industry offering plenty of room for expansion in the years ahead. eBay comes well behind Amazon (NASDAQ:AMZN) in terms of both size and growth in the business, but the stock is trading at conveniently low valuation levels. While Amazon is mostly an online retailer, eBay operates as an e-commerce facilitator, matching buyers and sellers of all kinds of items and making a commission on every transaction. This allows eBay to generate higher profit margins than Amazon, since the company doesn't need to worry about aspects such as inventory risk or distribution costs. Besides, most bricks-and-mortar retailers consider Amazon a dreaded competitive threat, while eBay can provide the resources for traditional retailers to join the e-commerce revolution via a proven and successful platform of e-commerce solutions. The company needs to do better on the revenue front, though. Constant-currency sales increased by a modest 6% in the first quarter of 2016, and management is working on different initiatives to jump-start performance going forward. Among them, eBay is building better product catalogues to provide an improved customer experience and attract more traffic from search engines. eBay stock is currently trading at a price to earnings ratio in the area of 14. This is a massive discount versus the average price to earnings ratio for companies in the industry, which is in the neighborhood of 32. If eBay manages to accelerate growth in the middle term, then the stock offers huge upside potential from currently depressed valuation levels. Apple stock is priced at ridiculously cheap levels. Shares of the iPhone maker carry a price to earnings ratio of 10.4, while the average stock in the S&P 500 index trades at a price to earnings ratio around 19.4. Companies in the hardware business typically trade at below-average valuations, but Apple is also remarkably cheap by its own historical standards, as the average price to earnings ratio for the company over the last five years is around 14.3. One of the main reasons for such a bargain-cheap price for Apple stock is that sales are moving in the wrong direction. The company reported $50.6 billion in sales during the quarter ended in March, a 13% decline versus the same period in 2015. However, there are reasons to believe that the decline in revenue could be transitory as opposed to a permanent phenomenon. Growth in the smartphone industry is slowing down on a global scale, and the iPhone 6 was a booming success for Apple in 2015, this is making year-over-year comparisons remarkably challenging in 2016. Nevertheless, Apple is still one of the most valuable brands in the world, and consumers are notoriously loyal to the brand. Chances are that sales trends will improve as more customers upgrade their iPhone models over the coming years, so current valuation levels for Apple stock seem to be an overreaction to a temporary problem. Priceline is the global leader in online travel services, meaning the platforms that provide access to online hotel bookings, plane tickets, and car rentals. The company makes nearly 85% of sales from international markets, so currency fluctuations can have a considerable impact on Priceline's financial figures when translated to U.S. dollars. Macroeconomic concerns are arguably the main reason why Priceline stock is now down by nearly 20% from its highs last year. However, the company has been facing macroeconomic headwinds for several quarters now, and this is not stopping Priceline from delivering impressive growth rates in a challenging environment. Total gross travel bookings amounted to $16.7 billion in the first quarter of 2016, an increase of 21% in U.S. dollars and an even stronger jump of 26% in constant currencies. The business model is also spectacularly profitable, Priceline makes operating profit margins in the neighborhood of 35% of revenue on an annual basis. 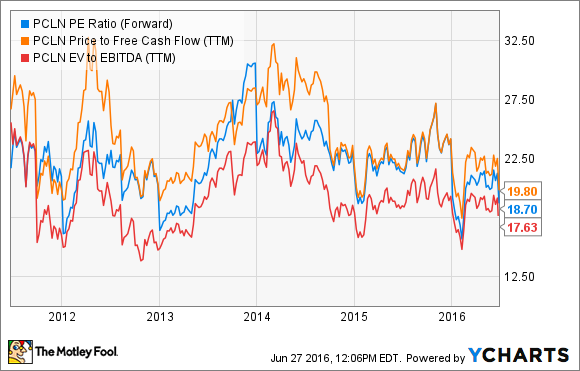 The following chart shows different valuation ratios for Priceline over the last five years, including forward price to earnings, price to free cash flow, and enterprise value to EBITDA. The three different indicators are painting a similar picture, and Priceline stock is approaching the low end of its historical valuation range. PCLN PE Ratio (Forward) data by YCharts. As long as international currencies keep depreciating versus the dollar, this will continue weighing on Priceline's financial performance. On the other hand, the company's long term growth story remains pretty much intact, and short-term weakness seems to be offering an attractive buying opportunity for investors in Priceline stock.